"These are troubled times… without leaders, chaos reigns." Paramount has released the third trailer for Michael Bay's latest Transformers movie, titled in full Transformers: The Last Knight. The last trailer we posted was focused on the young kids in the movie, but this one gives us a full look at everything going on. These movies (and the robots) keep getting bigger and bigger, with so much epic action it's hard to even comprehend what we're seeing. 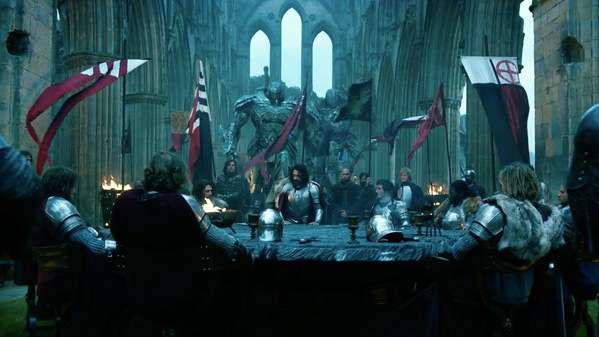 The huge ensemble cast includes Mark Wahlberg, Anthony Hopkins, Laura Haddock, John Goodman, Stanley Tucci, John Turturro, Josh Duhamel, Isabela Moner, Santiago Cabrera, and Liam Garrigan as King Arthur; plus the same Transformer voices as before: Peter Cullen, Frank Welker and Ken Watanabe. My sci-fi side makes me want to see this just because, but I'm still not that interested in any more Transformers films. I'm on the fence with this. What about you? You can also still watch the teaser trailer for Transformers: The Last Knight here, or the second trailer here. For more updates on this series, follow @Transformers on Twitter or follow Michael Bay at @michaelbay. Optimus Prime finding his home planet, Cybertron, now a dead planet, which he comes to find he was responsible for killing. He finds a way to bring the planet back to life, but in order to do so he needs to find an artifact, and that artifact is on Earth. Transformers: The Last Knight is once again directed by iconic American filmmaker Michael Bay, of all four of the previous Transformers movies, as well as 13 Hours, Pain & Gain, The Island, Pearl Harbor, Armageddon, The Rock, plus Bad Boys I & II previously. The screenplay is credited to Matt Holloway, Art Marcum and Ken Nolan. Paramount will release Transformers: The Last Knight in theaters everywhere starting June 23rd this summer. Anyone still excited to see this?